Although we at Edinburgh Villa Holiday Rentals didn't go to the Hogmanay party on Princes Street ourselves, our guests who stay at our Edinburgh Self Catering Apartments had a great time, and as a bonus it didn't rain! The view from our Westside Balcony Apartment was seemingly fantastic when the fireworks were on. I'm sure it was - here's a view on a clear January day from our Westside Apartment. At the moment we have quite a lot of availability for the holidays such as Easter and Summer, and also availability for when the RBS Six Nations Rugby game is on. This apartment is located in the same area as Murrayfield Stadium (West of the City Centre), and you could walk to the Stadium if you liked. The walk would probably be around 25mins to Murrayfield. 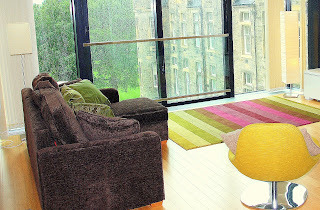 2016 was the first year of short term Edinburgh rentals for this apartment and we have received glowing reviews for its comfort and views! If you are specifically looking for accommodation at 'The Quartermile', which has become very popular with repeat guests over the years then visit our 'Quartermile Apartment' page on our website for further information. This Quartermile Holiday Rental again has lovely open views over parkland, is bright, sunny, modern and comfy. Again we do have availability for the peak weeks coming up and this apartment can sleep 4 adults + 1 teen (or younger) on the sofa bed. Visit our Edinburgh Villa website and contact us direct to check availability.